SJ really enjoys all the animals at the zoo - even the wooden ones! SJ has a new real fondness for instruments. While Nathan was putting together a new computer desk SJ found 2 small silver rod-like pieces that were taped together. She decided this was a flute and had a good time playing it. She was quite disappointed the next day when the flute disappeared and became part of the computer desk. So we decided it was time to buy her an instrument. 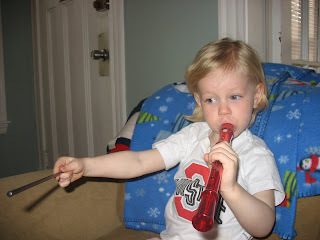 We settled with the recorder as well as a variety of other small instruments (a tamborine, kazoo, egg shakers, etc.) When we got home from the store we had our own little band going. Leading the melody on the kazoo was myself; leading the percussion on the fish drum was Nathan, and leading the tooting recorder and being the cutest band member was the conductor, SJ. Our repertoire includes the childhood classics: Twinkle, Twinkle Little Star, Row Row Row your Boat, Mr. Sun, The Wheels on the Bus, and Jingle Bells. We're thinking of taking the band on the road for a summer tour so if you're interested in booking us you'd better hurry. The final results of SJ's new hair cut! Today SJ got her first haircut. She was very excited to be able to sit in a "barber's chair." She was perfect! She had lots of fun sitting in the chair, holding the squirt bottle, and looking in the mirror. Of course we kept a locket of her hair for her baby book. SJs grandparents recently returned from an amazing trip to South Africa. We talked to SJ a lot about Africa and how her Grandma and Grandpa were there. Yesterday, she decided to build Africa out of her Legos. She had her toy airplane nearby with Grandpa as the pilot and her little Play-m0-bil safari car with Grandma behind the wheel. After she assembled her Africa she decided that it needed a door - because of course how else would you get in? SJ was so excited to share her Little Einsteins show with her friends, Ethan and Isaac. The episode they watched is about a baby chimp who is lost and needs to find his Mom and Dad. Each Little Einsteins program features a special artwork and a portion of a classical music piece. We learned that the musical piece in this episode was composed by a Czech composer named Smetana. The piece is called The Moldau which is supposed to represent the sounds of the Bohemian river, Vltava. (We learned all of this from our muscially inclined friend and neighbor, Dan.) Dan actually made a cd for SJ with this piece on it. Sydney asks for the "baby chimp song" and loves to air conduct to it. She even can tell when the music is getting louder and she conducts a crescendo, a term she learned from her Little Einsteins! I don't actually know if you can take conducting classes or how one actually learns how to conduct, but for now it's one of SJs favorite things to do and she's super cute doing it! Today SJ and I watched baby Mika for a while. SJ always has lots of fun with Mika and today was no exception. Today Sydney happily shared one of her treasured Bears with Mika when it was time for Mika's nap. She was a little less thrilled to have Mika sleep in her bed, however, but soon she got over it! She also spent time laughing with Mika and reading her stories. SJ hopes at least one of her teams will do well this year. Today, without any prompting she asked to wear her new Red Sox T-shirt! (For those of you blog readers who don't follow the Red Sox, today is the home opener.) While SJ is napping I get to catch a little of the opening ceremonies and the start of the game. Interestingly, they had a 4 jet fly-over Fenway and about 1 minute later I heard them over our house in West Roxbury. I rushed to the window, but was unable to put a visual on them. Cool nonetheless! SJ was very excited to get an Easter basket full of little goodies! SJ seemed to have a lot of fun with decorating Easter eggs. 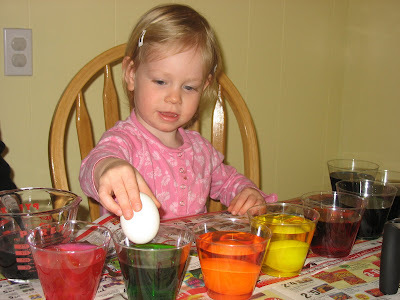 Each time she went to drop an egg in the cup we had to caution her, "Careful!" Otherwise, the egg would be dropped with force and you'd hear the cracking of the shell! SJ "helped" me bake her daddy's birthday cake. She likes to pour the pre-measured ingredients in the bowl. Then she has to leave the kitchen because the mixer scares her. 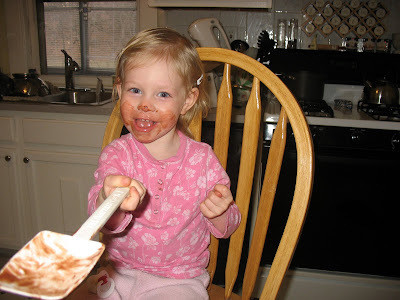 When the mixing is all done, she comes back to lick the spatula. Not a bad deal if you ask me. Me: "Sydney, what would you like to give Daddy for his birthday." Me: "What kind of drink?" Me: "O.k. I think we can get him some milk. Anything else you think Daddy wants?" Me: "Yes, cupcakes would be good to go along with the milk. Great idea! Anything else?" Me: "Really? You think Daddy needs some toys? What kind of toys would he like?" So, SJ got her Daddy a little firetruck for his birthday. SJ's first words were, "Mine!" when he opened it. Nathan did promise to share his firetruck with SJ and that seemed to make SJ feel very happy. 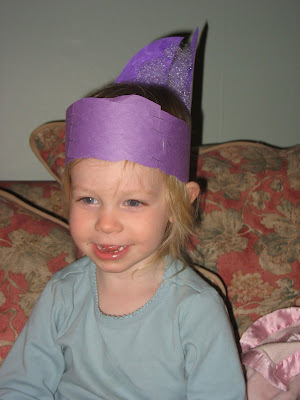 SJ's school apparently likes to make little holiday specific crown hats (see post on St. Patrick's Day.) So it should have come as no suprise that Easter would also get a hat - bunny ears. SJ loves donning them and then hopping around singing the Peter Cottontail song! Today I got SJ to wear jeans. 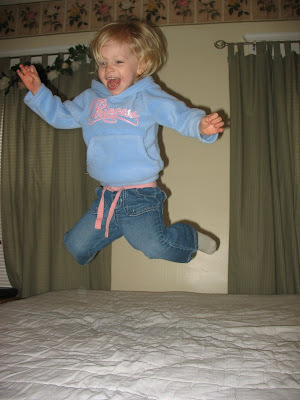 This is quite an accomplishment for me as she has been in a pink fleece, or other soft cotton pants, mode recently. She whined a bit and said, "I don't like jeans." But, I continued to dress her in them. All it took was a "Wow! Sydney! You look really good in these jeans. I really like them! They're nice" After this she was quite content with wearing jeans for the whole day. She was also excited about wearing her 'Princess' fleece and she kept telling everyone (mostly, our neighbor, Dan, and the lady at the bakery), "I'm a Princess!" Awe - so cute! Crazy weather here. Today it rained, sleeted, and snowed. I thought Spring had arrived. SJ enjoys it, however. 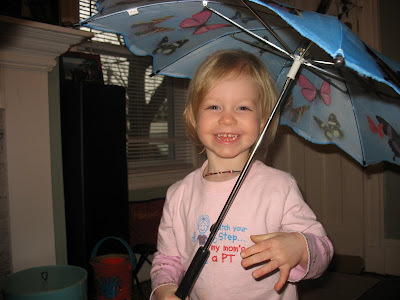 Loves the puddles and playing with her umbrella. OSU tried again to become National Champions, this time for basketball. Once again, they lost to Florida. SJ was a good fan, anyway. Both yesterday and today she requested her buckeye shirt and necklace. 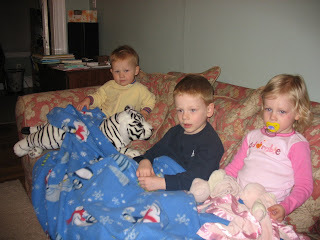 We went to our friends house last night for a yummy dinner, a "part-night" sleepover for SJ with friends Ethan and Isaac, and for me to watch a bit of the game. It was a fun night despite the outcome of the game. Nathan is on a business trip in Manchester, Englad for a few days so he didn't get to go.